Plastic comb binding machines are available from low volume personal models, to high production heavy duty comb binding machines. There is such a wide variety of machines to choose from that shopping can be frustrating; why can’t someone just make it simple? Well, we've done the homework for you by providing in-depth product comparisons on our most popular products to help you make an educated decision. In this review, we will compare the two Akiles MegaBind Plastic Comb Binders, including the Megabind-M manual punch and bind, and the Megabind-1E electric punch and manual bind. But first, let us review plastic comb binding as a whole, to ensure that this is the binding method you are looking for. Plastic comb binding is a traditional, economical, and simple binding method that is used in a variety of industries from personal use, to education, to marketing. The binding spines, known as plastic combs, are made of PVC plastic and consist of a spine of nineteen round rings that easily spread open for sheet inserting; the rings fit into rectangular holes along a standard letter size 11” binding edge. Plastic comb binding is the ideal solution for those who need to save money, as well as those who will be binding books that may need frequent editing. Because the plastic combs can simply be opened and closed, multiple times, editing a book is easy and doesn't require throwing away the binding comb spine to do so. In addition, plastic combs are great for consumers who need to customize the binding spine with printing, as our printing department can customize with printing or foil stamping for a one-of-a-kind look.They can also be customized to fit almost any book size; getting cut down to meet your specific needs. There are sixteen different diameters available ranging from 3/16" up to 2" thick. Combs are round in sizes 3/16" up to 1", and oval with three locking mechanisms for 1 ¼" and larger combs, holding the rings together, even with heavy and high capacity page filler. Plastic comb binding is very popular for user guides and instruction manuals, cookbooks, proposals, children’s books, presentations, and more. Some advantages that plastic comb binding has over other binding methods include that it is a common method, (making it readily available from a variety of outlets), it is inexpensive, it can be custom imprinted, it can be easily edited, it has a wide range of sizes and colors available, and it allows for perfect registration where the pages align evenly when opened or closed. Some disadvantages with binding with plastic comb include that there are fewer standard colors that with some other binding methods, that they can sometimes look a bit cheap, so are not great for expensive client presentations, and that pages cannot be turned a full 360 degrees. If Plastic Comb Binding still sounds like the correct avenue for you, then read on to learn about two of our most popular comb binding machines, the Megabind series comb binders. With their high quality metal construction and ease of usability, Akiles Products is one of the most famed binding machine manufacturers in the world; and their Megabind series is no exception. 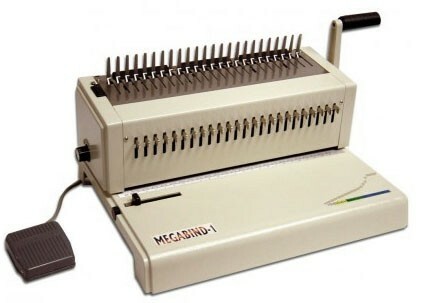 The Manual Akiles Megabind-M Comb Binding Machine is perfect for mid-volume usage in the office. It has a binding capacity of up to 2", and features easily disengageable punch pins. Fully disengageable pins are standard, letting you disengage multiple punching pins to allow for perfect centering of odd-sized sheets smaller than standard letter size - simply pull a pin to disengage it and prevent that hole from being punched. The maximum binding edge is 14" and features 24 holes for accommodating up to legal sized paper in just one punch. In addition, the punching throat is open ended, so you can even punch and bind sheets longer than legal size by simply punching your pages once, flipping them over, lining up the holes, and punching them again. The Megabind-M Comb Binder will punch through a total of about 20 sheets (of 20 pound paper) in just one pass, allowing for fewer punches to get your book bound. The Megabind-M has a punching speed of up to 5,000 sheets per hour, or about 250 books per hour, depending on your operator. In addition to these great features, the Akiles Megabind-M Comb Binding Machine features a diameter guide to help you select the correct comb size based on the thickness of your book, and a margin depth guide, letting you choose between three settings of margin depth for the punched holes. The Megabind-M measures about 12 ½” x 16 ½” x 10” unpacked, and weighs about 30 lbs. Its size and weight make it fairly easy to transport to multiple locations, however, there is always the option to place the Megabind-M on a binding station to make it even easier. The Electric Akiles Megabind-1E Comb Binding Machine is perfect for high-volume usage in the office or production facility. It has a binding capacity of up to 2", and features easily disengageable punch pins across the entire 14" binding edge, so you can prevent single or multiple holes from punching with just the pull of a pin. Unlike other binding machines, fully disengageable pins are standard (most machines only have a couple, and fully are only available in more expensive "plus" models). The legal size binding edge features 24 holes for accommodating up to legal sized 11" x 14" paper, and with the open-ended throat, you can actually double that punching length by just punching once, flipping your book, lining up the holes, and punching again. The Megabind-1E Comb Binder features a single handle for the comp opener and foot-pedal for the punching. The foot pedal punching activation allows you to use both hands freely to hold your sheets in place, or pull the handle and close the combs of another book. It will punch through a total of about 20 sheets (of 20 pound paper) in just one pass, allowing for fewer punches to get your book bound. The Megabind-1E has a punching speed of up to 6,000 sheets per hour, depending on the operator (about 1,000 more than the manual machine). In addition to these great features, the Akiles Megabind-1E Comb Binding Machine features a diameter guide to help you select the correct comb size based on the thickness of your book, and a margin depth guide, letting you choose between three settings of margin depth. The Megabind-1E measures about 31” x 21” x 15” unpacked, and weighs about 40 lbs. Its size and weight make it slightly difficult to transport to multiple locations, so we recommend placing the Megabind-1E on a mobile binding station if using it in multiple locations. 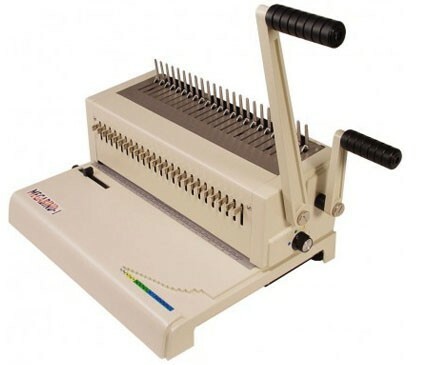 Although a manual machine, the Akiles Megabind-M Comb Binding Machine fits well in a small to medium sized office while the Megabind-1E Comb Binding Machine fits well in large sized offices or facilities who plan to use the machine daily. Both machines are perfect for making proposals, reports, calendars, and much more. With their metal construction by one of the most renowned binding machine manufacturers in the industry, the Megabind Series Comb binders are proven to be extremely durable and dependable units. Both machines come standard with a one year manufacturer’s warranty; one of the best warranties in the market. The deciding factor between these two machines should be the speed and location of the unit; whether it will be for office use of about 30 books per week, or higher production use with 100 or more books per week. In addition, consider the convenience that comes with an electric foot pedal operation. Unlike push-button operation machines, the foot-pedal allows both of the operator’s hands to be free for preparing the next book. In conclusion, however, the Akiles Megabind series binding machines are built tough and with an ease-of-use that can be difficult to find—both models are perfect for nearly all consumers looks to speed production and save money.